R592 Polyester Silicone Splicing Tape is a 50μ clear polyester film, single coated with a high performance green silicone adhesive system, with 83μ total thickness and recommended for high temperature masking applications. R592 can be supplied with fluoro-siliconised liner for converting and die cutting operation. 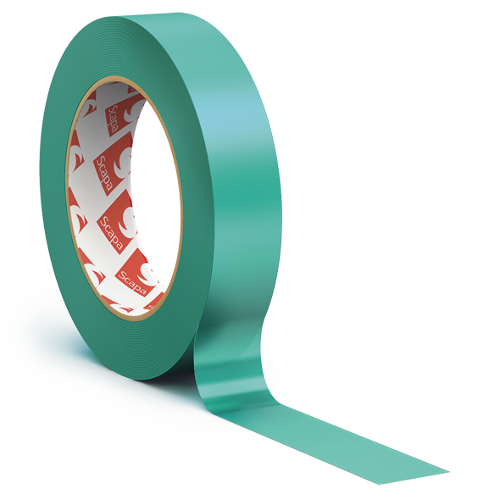 General purpose masking tape for powder coating applications. High temperature silicone adhesive that withstands 180°C long term. The rolls should be stored flat on their cut edges in the original packaging. The product must be protected from dust, heat, moisture, direct sunlight and solvent fumes. Storage temperature between +10°Cand +30°C. Under these conditions, the storage life of the tape in a temperate climate will be at least one year. Surfaces should be clean, dry and free of dust, grease, oil or other contaminants. Adhesive performance should be carefully checked when used on substrates containing plasticisers.